Ready To Practice A Little “Francais”? Cycling to Montmorency Falls is one of many tour and adventure options included in this trip – but better bring your own phrase book! You can get by in English, of course, but Quebecois - the friendly folks of Canada’s French-speaking province, Quebec – certainly appreciate the odd ‘merci’ or ‘s’il vous plait’ as you order your morning croissants - and it’s part of the adventure. You might also want to practice your Scottish brogue - because after exploring Montreal and Quebec City you’ll board a sleeper train ... and wake up in ‘New Scotland’ – Nova Scotia – where you’ll learn about Canada’s other Celtic heritage, and enjoy fiddle music, beautiful coastlines and delicious lobster dinners. In Quebec City learn about the history of France in Canada. In Montreal, enjoy a cosmopolitan melting pot of French-speaking people from around the world. And in Halifax explore a fascinating history of the sea and immigration from Europe. Eastern Canada has a beauty and charm all its own and many people from south of the border come back here year after year…. Your discovery of historical Canada begins as you step out onto the cobblestone streets surrounded by stunning architecture and quaint cafes. Join Montrealers on one of the many terraces above the city in Old Montreal, or stroll Mount Royal and listen to local musicians work their craft. Enjoy the day discovering the vibrant city of Montreal - rich in history and culture. 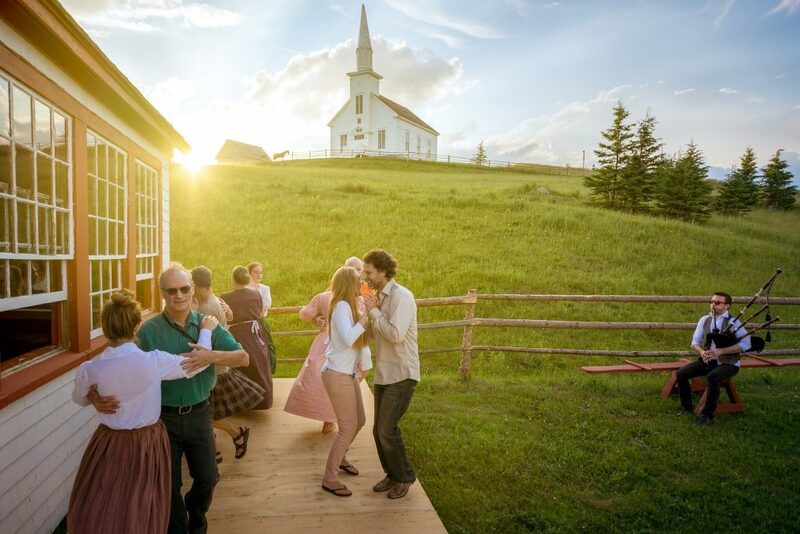 Travel through some of French Canada’s most picturesque countryside as your Canadian vacation heads toward Quebec City. Step off the train and into a little bit of Europe - right here in Canada! Enjoy the day exploring the walled city and its cobblestone streets all while taking in the stunning architecture and history. Enjoy Quebec City and its countryside today before boarding VIA Rail's Ocean train for an overnight journey towards Canada's Maritime province of Nova Scotia. A private driver will pick you up from your hotel and take you to the Sainte Foy train station. Board the train in Quebec City late this evening and start your journey east towards Halifax. Settle into your cabin as you travel along the St. Lawrence River. Leave the busy city behind, and explore the Canadian countryside on a leisurely 4-hour bike tour to Montmorency Falls from Quebec City. Pedal along the St. Lawrence River, and gain insight into the region’s rich history and diverse geography. Today you are free to explore the city on your own. This evening, dine in the historic Maison Jacquet built in 1675. Feel the history of the historic home, as you dine on traditional Quebecois cuisine! For an additional cost, choose a helicopter tour to soar over Quebec City on a 55km (34 mile) loop. You'll fly along the St. Lawrence river to Montmorency Falls, and over the iconic Chateau Frontenac and historic Old Quebec. Included is a private cabin onboard The Ocean Train, in Sleeper Plus Class. Relax in a comfortable armchair next to a large picture window during the day. By night, settle into a cozy upper and lower beds. The cabin features a private toilet, sink and mirror, and also a small shower. Watch the scenery from the train's viewing areas, and enjoy meals in the dining car. Travel through rural New Brunswick and Nova Scotia on The Ocean train. Your journey ends as you arrive in Halifax late this afternoon. Explore the welcoming Celtic atmosphere of the Canadian Maritimes’ largest city. Keep an eye out for the Bay of Fundy's tidal flats as you travel through New Brunswick. Soon you'll see Nova Scotia's picturesque rolling farmland, before arriving in the historic coastal city of Halifax. A driver will pick you up at the train station, and take you to your hotel. Overnight at the Prince George Hotel. This hotel is located in the heart of downtown and is connected to The Downtown Halifax Link, a convenient network of climate-controlled pedways and the Halifax waterfront near restaurants and shops.The property features an on-site restaurant, landscaped patio, indoor pool, fitness centre and sundries shops. Enjoy the hotel’s convenient location, close to attractions such as the Art Gallery of Nova Scotia, Museum of Natural History, Citadel National Historic Site, and Neptune Theatre. Head out and discover the charm of Nova Scotia. Rich in Celtic heritage and bursting with historical significance, this sea faring region offers some of Canada's most picturesque coastlines, with fishing villages perched on the Atlantic Ocean. This is the last night of your Canadian train vacation - the perfect excuse to treat yourself to fresh seafood - the ultimate regional specialty. With your own private driver and car, sit back and enjoy the scenery as you make your way along Nova Scotia’s unique coastline full of history and culture to Peggy's Cove. The picture postcard village stands on granite rock, high above the crashing Atlantic surf. Enjoy a winery tour to the beautiful Annapolis Valley where you will visit 3 beautiful wineries and learn all about what makes this region perfect for creating their award wining red, white and sparkling wines. With a local guide discover the highlights and hidden gems of Halifax through photography. See historic images of the neighborhoods you'll visit, while learning to take great photos from the best vantage points. Cameras, smart phones, and tablets are all great for this tour. Much too soon, you bid farewell to the Canadian east and the scent of salt water in the air as your Canada travel experience ends, with departure from the Halifax airport. A private driver will take you from your downtown hotel to the Halifax Airport. Overnight at the Lord Nelson Hotel & Suites. The landmark Lord Nelson Hotel offers an unparalleled downtown location, just across the street from the beautiful Public Gardens. Originally built in 1928, the hotel combines historic charm with contemporary style. It offers a little something for everyone, including complimentary internet access, on-site dining, a fitness facility, and business centre. An additional day of accommodation has been included in Quebec City prior to boarding the train late in the evening. Small Group tour in Montreal is available from the May 23–October 19, 2019 on Mon and Wed start days of this trip. For Saturday starts, ask for alternate sightseeing options by vehicle. Our trip was absolutely wonderful. The accommodations were very good. The timing and scheduling was just right for us and our schedule. The walking food tour and the walking history tour of Old Québec City were especially fun and interesting. Our tour guides were very knowledgeable and made the tours lots of fun. I was very pleased with knowledge and help we received from the Fresh Tracks staff. The organization and planning for our trip was very good. The trip was educational and entertaining. The level of physical exertion was totally within our capacity. We were an older demographic. The train experience was delightful and enjoyable. Our trip was as wonderful as we anticipated. We enjoyed the variety of the places we visited and appreciated the kindness of people we met. We were well informed and able to make a few decisions and changes along the way that enhanced our experience. The best parts included: the countryside tour of Québec with guide; Lunenburg and walking tour; the B&Bs in New Brunswick; Halifax Gallery of Art and Maude Lewis exhibits; Great George Inn in Charlottetown PEI; Acadian Experience in PEI; peaceful rural drives in PEI; Toronto and Niagara Falls. We enjoyed the Fairmont Hotels in all 3 cities. And, we saw the Grand Prix bike race in Québec City, and Invictus Games excitement in Toronto, both unanticipated. It was an outstanding trip. Everything that was supposed to happen did happen. We liked the balance between planned activity and free time. Everything you selected or recommended was absolutely first rate.